The 2018-2019 State of Digital Transformation, by Brian Solis, principal analyst at Altimeter, a Prophet company, documents the constantly evolving enterprise across industries. 1. A successful digital transformation is an enterprise-wide effort that is best served by a leader with broad organizational purview. 2. Ownership is moving to the C-suite and managed by cross-functional, collaborative groups. 3. Innovation is staking its claim within the organization. Nearly half of respondents report that they are building a culture of innovation, with in-house innovation teams becoming the norm. Healthcare organizations are well represented in the research, and many of the overall findings ring true for across the healthcare industry. Healthcare organizations are addressing transformation with the same motivations as other industries—to better capture growth opportunities in new markets; to keep up with evolving customer preferences and behaviors; and to respond to new competitive pressures. Across industries, companies are increasingly involving functions beyond IT, including customer service, operations, sales and marketing. Similarly, healthcare organizations are working to show that digital transformation can provide an ROI and is not just a cost center. Where healthcare starts to look different is when it comes to the employee’s role in digital transformation. Human capital plays an outsized role in healthcare when compared to many other industries. Healthcare discovery is knowledge heavy and capital asset-light relative to other industries and healthcare delivery is highly reliant on human interactions between associates and patients. The human resources function itself is more likely to be involved in digital transformation. With 30% of respondents from healthcare organization saying human resources is a focus vs. 13% of respondents from other Industries It’s clear that human resources are a key area of transformation for the healthcare industry. Becoming more agile to compete in an era of nursing shortages and a general war for talent is paramount. 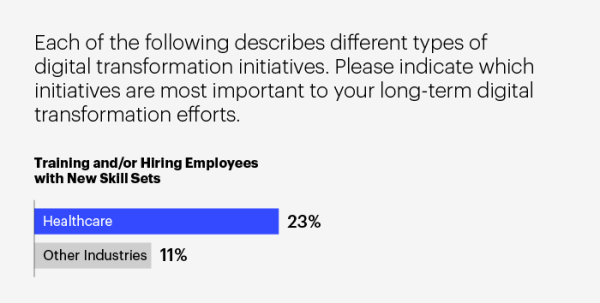 Furthermore, the HR function is more likely to be involved in organization-wide transformations through participation in workgroups, steering committees and cross-functional teams, 42% vs 30% respectively. Nevertheless, as Prophet colleague Helen Rosethorn indicated in her cross-industry report, ‘HR As A Force For Digital Change’ the vast majority of HR functions are at best involved in the digitization of people processes rather than a more holistic role in envisioning and innovating a digitally enabled customer/patient/employee experience. There is a greater focus on skill development to catalyze transformation. More healthcare organizations, 23% compared to 11% outside of healthcare, report training or hiring employees with new skill sets as one of the most important long-term initiatives to catalyze transformation. Healthcare, it seems, is closer to adopting a fundamental Prophet tenant: Digital transformation is less about technology and more about creating an organization that is prepared to thrive in the digital era. There is a greater recognition of the need for fundamental cultural change to successfully digitally transform. Of course, this may be because healthcare is more in need of change. 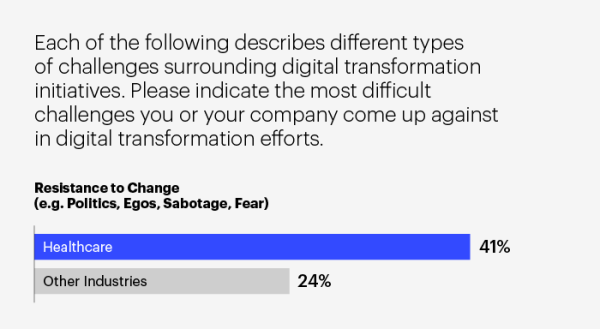 Healthcare organizations are more likely to believe that resistance to change in the form of politics, egos, sabotage and fear is a barrier to transformation than non-healthcare organizations, 41% to 24%. Employee engagement is more likely to be a metric of digital transformation. By a 49% to 31% margin, healthcare organizations are more likely to use employee engagement and satisfaction related metrics to measure progress on their transformation journey. None of this is to say that healthcare organizations are any further along in their digital transformation than other industries, and anecdotal evidence suggests the opposite. However, these findings do suggest that the path toward continued transformation is likely to require continued focus on culture change and employee engagement, in addition to technology investment and installation. In doing so, healthcare organizations have an opportunity to drive greater impact and fundamentally improve the way they deliver value, to employees, physicians and consumers.